Should you book all your hotels ahead of time to be sure you get exactly what you (think) you want? Or should you wing it and wait to find a place to stay until you actually roll into town. Both. Neither. (I know: I'm a big help; it'll all make sense shortly.) Below is my advice, but first ponder this: Until you're actually in the room, you won't know whether it's got a view of Sr. Peter's...or of the sewage processing plant across the street. Type one: You're happiest making an itinerary and sticking to it, and you want to be sure you get the absolute perfect room every night. Advice: Go ahead and book rooms for the entire trip now. Seriously. You'll feel better for it. Look into whether your plans happen to land you in a town on a festival day, in which case you're probably in for the highlight of your trip, but should reserve rooms immediately, from your home country, as far in advance as possible. Same goes for trade fairs (not the trip highlight bit, but definitely the advice about booking ahead). Type two: You prefer to play it loose and go with the flow. You have a plan but not a set itinerary, and want to be free to chuck the plans out the window in order to stick around a favorite town longer (or cut out once you realize you're bored), hang out an extra day or two to catch a festival, or just follow that cute guy/girl you just met wherever he/she is going. Advice: Don't book too many hotels ahead of time. It will cramp your style and make you wistful for all the missed opportunities of spontaneity (and possibly trip you up with possible bad choices). However, I do recommend that you at least reserve the first night(s), then wing it from there. I'd also book a room for the last night as well, because I know that when I'm pulling into Rome (or wherever) on the final day of a long, tiring trip and know I still have to repack everything for the flight the next day and get up way too early to get to the airport, the last thing I want to have to do is hunt for a hotel. Type three: You're like most people and fall somewhere between the first two types. You truly want to explore, but are also nervous about leaving too much to chance. You have a planned itinerary, but are willing to alter it if some great opportunity comes along (or you discover that the bits of Italy you are truly enjoying are not the bits you expected). Showing up at the reception desk (in which case you're definitely a "Type two" person). The first two methods are pretty straightforward: you book online, get a confirmation email, print that out, and bring it along as your receipt/proof of reservation. Even if you call for a reservation, many hotels these days require you to send an email (some still insist on a fax) with the dates you intend to arrive and leave, how many people, and a credit card number (this protects them from no-shows). All this is a fine procedure, since your copy of the email or fax gives you a printed receipt of sorts to prove you've booked a room (booking errors do crop up from time to time). That said, some smaller, cheaper hotels won't reserve far in advance for fewer than three nights. This is to protect them from cancellations, and no assurance on your part seems to change their policy. They'll hold a room only if you call from the train station and tell them you're physically on your way. In most cities—Rome especially—as soon as you step off the train or boat hotel touts will swarm you in a feeding frenzy. Some are legitimately drumming up business, others are out to fleece you. Make sure they point to the exact location of their hotel on a map, and get the price set firmly in writing before you go off with them—and never pay in advance. Look at the photos they show you, but remember that a fisheye lens in the room's upper corner and a sneaky collage of the inn's best furnishings all in one room can make a dismal cell look like a palatial suite (well, almost). There's a lot that can go wrong with a hotel room—and a lot that the photos on the Web site won't tell you—so I play it safe by playing by ear. Sure, sometimes I have to scramble a bit to find a room, but I rarely get suckered into settling for a hellhole that's been paid for in advance. When e-mailing or faxing for a hotel room, don't write down the dates in number format (11/6/17). Why? Well, while in the USA that would be read as "November 6, 2017" in Italy it'd be "June 11, 2017" because they—like the rest of the world (we're the oddballs)—put the day first, then the month, then the year. At any rate, to avoid confusion, just write it out "6 November 2017." Also, Italian hotels like to define a stay by the arrival date and the day you actually check out, not the last night of your stay. In other words, if the last night you intend to sleep there is Nov. 8, they'll think of you as "departing Nov. 9," so saying you want to stay from Nov. 6 to 8 might end up in only two nights' booking, not three. I always write both the arrival and departure dates followed by the number of night total in parentheses, again just so there's no confusion: "Arrive: 6 November 2017. Depart: 9 November 2017. (Stay: 3 nights)." Booking.com (www.booking.com) - Put it this way: when I had to book a trip to Sardegna this past fall for a magazine assignment, I canvassed various guidebooks and websites looking for just the right hotels...and ended up finding (and booking) every single one of my hotels with Booking.com. It's that good. It also has lots of nifty, user-friendly options, like arranging results for hotels according to neighborhoods, or their proximity to particular sights. HostelWorld (www.hostelworld.com) - Yes, its the premier independent booking site for hostels, but it also includes cheap hotels, campgrounds, and other budget options ignored by virtually every other search engine out there. 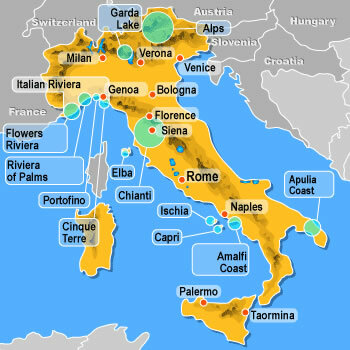 I've also begun posting my own hotel picks in every price category for Italy's major cities—a time-consuming task, but at least I've got Rome, Florence, and Venice largely finished. HotelsCombined.com - Brings together the results of several booking engines so you can compare side-by-side.